Vintage Kids' Books My Kid Loves: What Do You Say, Dear? I know it seems like we read a lot of Sendak, but there is just an endless parade of titles to be discovered. This one has to be the strangest I've seen so far. Quirky and delightful. I just love his stuff, the way he thinks about kids and the writers he hooks up with. Similiar to early Peanuts, his books touch on the cynical, subversive side of childhood. Each situation is absolutely absurd, yet the answer to the question is always some delightful, everyday reply. Teaching manners through the wildest scenarios. Too funny! Not surprising though, as kids think in these type of outlandish story lines all the time. 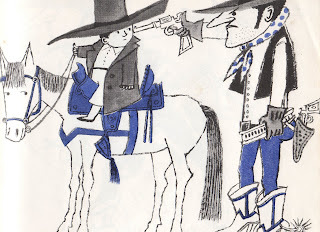 Also.... like the use in this picture of a bad cowboy holding a gun to a kid's head... you're not gonna see that flagrant sort of honesty in today's PC day and age.